In the pantheon of best-selling Scottish authors, JK Rowling reigns supreme. Estimates from 2013 indicate that she has sold at least half a billion books. That puts her more than an order of magnitude ahead of contemporaries like Ian Rankin (20 million), Alexander McCall Smith (20 million), Val McDiarmid (11 million), or Alastair Grey (dunno... but it's less than the others). Even dead Scottish authors like Alastair MacLean ‘only’ sold 150 million books. Unless we were to cheat and consider James VI the author of the James VI Bible (James VI would insist the author was God), then nobody else comes close. So who is Sir Walter Scott in comparison to volumes like that? What did he ever do for us? 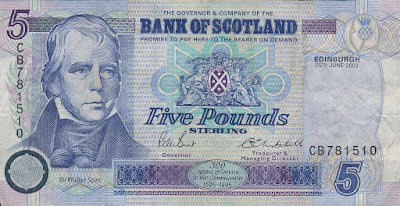 What about saving Scottish banknotes? Since 1696 Scotland's banks have always issued their own notes - they are the oldest paper money in Europe. In the early 19th century, pressure mounted by the British government to discount these notes. Sir Walter Scott was having none of it. Writing anonymously as Malachi Malagrowther in the letters page of the Edinburgh Weekly Journal, Scott campaigned - successfully - for private Scottish banks to retain their distinctive pound notes. Or what about the rediscovery of the Honours of Scotland, the Scottish crown jewels? After the union of 1707 they were put in a chest in Edinburgh Castle and forgotten about. But when George IV visited Scotland in 1822 - a visit also orchestrated by Sir Walter Scott - Scott and some fellow antiquarians did some detective work and located the jewels to present to the king. Imagine their satisfaction on opening the chest and being the first people to see them for over a hundred years. If that's not enough, what about reconciling the Highland and Lowland Scots to each other? Lowlanders had liked to consider Highlanders barbarians since at least the 15th century. The apogee came in the Jacobite rising where traitorous troops in tartan marched on Derby. The Highlands were brutally pacified. It was only after Highland soldiers had made a huge blood sacrifice fighting for the British Empire that the moment had come for people to be receptive to Scott's message. He created a synthethis of Scottish culture, the kilts and bagpipes of the Highlands coming to represent all of Scotland. And the stories Scott wrote were so popular, people wanted to see the places they were set. 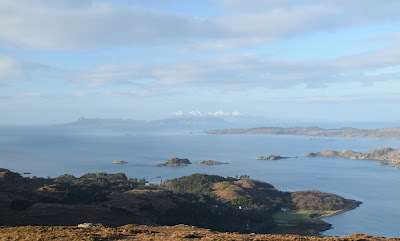 Thomas Cook brought Scotland’s first paid tourist trips to the Trossachs. They were there specifically to see the scenes made famous in Sir Walter Scott’s The Lady of the Lake. So Sir Walter Scott invented the Scottish tourist industry. The story of Bruce and the spider. The phrase, ‘The Wars of the Roses’. JK Rowling sold more books. But what will her legacy be? Very interesting post. We may need someone like him again to save real cash from disappearing altogether in the near future and small towns and villages becoming nothing more than commuter centres when the heart and bricks and mortar facilities are ripped out under the relentless drive to an online- cashless society that governments and large companies are year by year determinedly pushing us towards. We need a hero like that now to illustrate the future damage and downsides a completely cashless society and online culture might bring to every high street.In 50 years time will the notion of High Streets and Town Centres even exist? Or will fast food, coffee, nail bars and vaping shops be the only things left to wander round at the weekend? I don’t think the the changes on the High Street are down to lack of paper money, you can swipe a card or even a mobile phone these days and still use local shops… its more part of a wider trend. Towns started as places for trade, manufacture and to catch up on the news, the manufacture part long since left our town centres for factories and now the trade part is going too… so only the social side is left and needs to take centre stage. Whatever else goes online or out of town we will still need hairdressers, pubs & cafes, restaurants, anything to do with the body like massage therapists or gyms. There is definitely a big gap for more social spaces, but the challenge is getting people to use them instead of sitting at home with the curtains drawn!